Any artist that lists Sturgill Simpson, Diana Jones and Old Crow Medicine Show as its associates has been working in good company. Throw in the effects of these associations and you are certainly heading in the right direction. 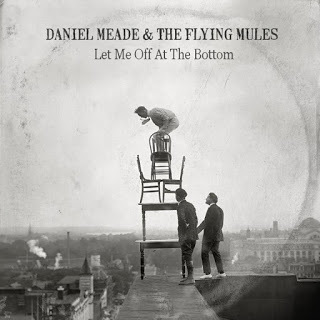 Daniel Meade is the fortunate artist to be in this position and he is set to reveal a new record to audiences at the end of May. Billing the record alongside the memorable name of his band, the Flying Mules, Daniel retains the successful formula from his debut release and unleashes eleven cracking tunes to those within its listening vicinity. LET ME OFF AT THE BOTTOM is an unapologetic rip roaring retro album, brimming with the classic combination of pacey efforts and more casual numbers. Whatever the vibes and tempo, each track adds value to the album with impeccable clarity. Daniel has been creating waves in his native Scottish music scene over the last couple of years, but a couple of recent link ups down south present the opportunity for a wider nationwide focus. Despite being in the can for quite a while, the album has found a new partner in south coast based operation At The Helm Records for its release. At the same time Daniel has also started working with BPA Live in order to secure more gigs around the country. He will join many enterprising and likeminded artists on these organisation’s books with Daniel being the perfect fit. A support slot for Sturgill Simpson in 2014 and a live set at the Southern Fried Festival in Perth last year are the two occasions when I’ve seen Daniel live, with both performances being impressive. This new album is very much an extension of his live act with its foot stomping rattling appeal and the orchestrated guitar pieces sparkling from Daniel’s sidekick, Lloyd Reid. There are lots of styles flowing from the songs on the album, but think a touch of boogie woogie, traditional country, and rootsy rhythm and blues, and you will not be too far off the mark. The relatively simple song structures make this an undemanding listen, made even more palatable by layers of catchy melodies infiltrating both verses and choruses. A slight hint of Hank Williams can be detected in the title track ‘Let Me Off at the Bottom’ which doubles up as one of the record’s stronger numbers with a straightforward sentiment of where you find life most comfortable, tongue in cheek or not. ‘Please Louise’ has been the track syphoned off for pre-release promotion and is probably as representative of the sound of the album as you get. The two opening numbers hit the traps straight away, separated only by the length of their titles, ‘Back to Hell’ and ‘There’s a Headstone Where Her Heart Used to Be’. For an element of variety, head to the final stages of the record where a duet with Siobhan Wilson can be found under the title of ‘Leave Me To Bleed’ and the really effective track ‘Count the Roses’ almost drifting into classic pop territory. Earlier in the album, ‘He Should’ve Been Mine’ puts the breaks on the unrelenting pace and if you are waiting for the ubiquitous drinking song, the last track fulfils that requirement with ‘The Bottle Fell for Me’. To say ‘Poison Dart’ has a particular old time feel is heading towards ‘stating the obvious category’, but sometimes you just have to be as upfront as the writing and playing style of Daniel Meade. LET ME OFF AT THE BOTTOM finds its groove early on and perfects its execution. All eleven songs are originals that indicate just how smart Daniel is at honing in on a particular sound. A timeless revivalist? Maybe. A clear and confident performer? Definitely. The curator of an enjoyable record from start to finish? Without doubt. You can ask no more than to make a record that easily connects with the listener. Daniel Meade and the Flying Mules have done just that.